Submitted by Susan Miller on Mon, 05/07/2007 - 07:28. They have only begun planting. 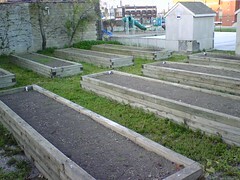 They will work with kids from the center to teach them about this innovative method of urban gardening. In addition to the City Fresh link, they also suggest visiting Added-Value. Submitted by Jeff Schuler on Mon, 05/07/2007 - 09:50. Did you go to the "Asphalt Gardening 101" workshop (New Agrarian Center: Events) they held there on Saturday? I didn't see it until just now. Submitted by Susan Miller on Mon, 05/07/2007 - 09:56. Thanks for posting the image. How did you do it? Submitted by Jeff Schuler on Mon, 05/07/2007 - 12:55. Submitted by Susan Miller on Mon, 05/07/2007 - 13:19. Thanks for the primer and for posting this image. Glad it has spurred discussion. Now that we have met in person you might get that I am too old for an html primer. I'll give it a shot, but make no promises. More importantly, so are many many older folks whom we might like to see posting here, there and everywhere. Just because we are older and html illiterate doesn't mean we're dumb. Maybe I wasted too much time working with actual live minds and bodies in dance studios, but it was worth it somehow at the time. At this point, I would like to get the ideas and images out there, but have little patience for technology that is designed for people who grew up in front of the video, computer hearth despite the fact that I spend an inordinate amount of time there now myself. I followed the directions provided her by Martha Eakin a while back, but it didn't work and my day was pressing on me like a tidal wave. I have used that method before and it worked. Today and for the past few months I have just lost patience or something changed or whatever. Maybe Derek will or maybe you can provide the realneo or drupal primer about not link to (I can insert from an existing web image), but add from your own files an image for those of us who don't have the html time or patience. If I have to learn code, I do, but it is just not my priority. So perhaps there will be those of us who are slick at this and others. Today I just need it to be easier and more transparent. But today is not too different from other days. I am busy learning other stuff -- to share what I learn has to be easier... it just has to. Submitted by lmcshane on Mon, 05/07/2007 - 15:35. Submitted by jenita on Mon, 05/07/2007 - 10:53. I'd like to see their garden in-progress. My own raised bed (not on asphalt) is a much shorter stack of cardboard, sand, hay and then soil. I don't trust Tremont's native soil for growing things that go into my mouth . . . Do you know anything about rain barrels? They've been on my mind lately. Submitted by Susan Miller on Mon, 05/07/2007 - 12:11. Then if you are ready to spend $75, go get one from Carl or wait til we can come up with a work around to this new rain harvesting monopoly. Submitted by jenita on Mon, 05/07/2007 - 16:30. Submitted by jenita on Tue, 05/08/2007 - 16:37. Guess I'll just wait . . . and keep an eye out for some free barrels. Submitted by Jeff Schuler on Mon, 05/07/2007 - 21:21. I sidetripped and stopped by for a snapshot tonight. The area was locked up. A sign informed me I was being videoed climbing the fence and craning my camera-phone over for the picture. Submitted by Susan Miller on Tue, 05/08/2007 - 17:20. This does not look like the garden I visited on Stanard on Saturday afternoon. Maybe take a ride by again and see if you can see an actual parking lot with big piles of wood chips at the very back edge adjacent to a building. This looks very far along and there was no green stuff that I could see where I visited. Also there were no woodedn sides. Maybe they did a lot of work over two days, but if that's so they must have had an army. i guess i'm not sure. Submitted by Jeff Schuler on Tue, 05/08/2007 - 17:33.
i was impressed with how built up it was; i guess there's a good reason. Submitted by Jeff Schuler on Tue, 05/15/2007 - 10:44. Help to build Asphalt garden by Coit Market? Submitted by Norm Roulet on Tue, 05/08/2007 - 19:17. It is interesting to see this come up - I was just at a meeting of a health initiative in East Cleveland with a project to build an asphalt garden on an old parking lot in East Cleveland by the Coit Farmers Market. If anyone is interested in helping plan and develop a big and important asphalt garden, let me know! They can use all the help they can get. Submitted by Norm Roulet on Sun, 05/13/2007 - 17:07. I was over at the Coit Road Farmers Market the other day and snapped a shot of their asphalt lot where they plan to put a very large community garden - Maurice Small and Elle Adams and others are advising them on the planning of this - it is a big project and a nice opportunity to be involved in a major asphalt garden development from the parking lot up (this was formerly a parking lot for all the workers in all the factories in the area that are not abandoned or downsized). Submitted by Norm Roulet on Sun, 08/17/2008 - 15:43. I just came across this photo of the Coit Road garden site in 2007... just an abandoned, unused parking lot back then... it is loking very good now, and I featured it in this recent header on REALNEO for proof... check it out, next time you visit the Coit Road Farmers Market, across the street! Submitted by Tremont Farmers... on Sat, 06/13/2009 - 06:33. I have been going to Coit Rd Market since I moved here 10 year ago, and it's heartening to see all the activity in the garden. Submitted by jenny07 on Thu, 11/18/2010 - 01:04. The informaton that you have given in this blog is really impressive..I would like to read more on the asphalt garden..Please keep updating your blog..
Is this spam? Should it be deleted? Submitted by Norm Roulet on Thu, 11/18/2010 - 01:35. We get lots of spam postings by fake accounts on realNEO - and this probably qualifies - the user does not seem real or connected to the link so is placing a link for some commercial reason... I'm assuming. The posting is on target and friendly enough so not offensive - it links to a company they sells rainwater and greywater systems, and the information there may be useful to visitors - there is nothing wrong with the link or site it goes to - if a representative of the company posted this I would think it was fine and a chance for realNEO users to dialogue with someone in the industry. I'm curious what other realNEO visitors think, and I invite Jenny07 to share more about rainwater systems, if she is involved in that industry. It is a good industry with lots of good people there and they are welcome here - people putting random links here for some other commercial reasons are not welcome to make such postings here. Any thoughts? Is this spam? Should it be deleted? Submitted by Jeff Buster on Fri, 11/19/2010 - 00:44. I agree this post is very marginal. The Jenny 07 post is not directly relevant to asphalt gardening, and in fact adds nothing to the asphalt discussion. If Jenny 07 had posted elsewhere on Realneo - ie where rainbarrels were the topic, then maybe the Jenny 07 link out to one commercial rain barrel would be acceptable - because the link would be on topic, relevant, and direct input from a rainbarrel manufacturer. But Jenny doesn't even suggest why the rain barrel in the link is superior/different than any other rain barrel - so the post appears nothing more than a commercial web link. Jenny07 Realneo profile is also completely hollow - no asphalt gardener is 007. Admin can just remove the rain barrel hyperlink, and leave all this what-is -spam--discussion in tact. Submitted by westward on Fri, 11/19/2010 - 01:27.
and removing the link is a good idea. Maybe she will return to realneo to post info on this topic. Spammers are getting pretty good at getting around this last anti-spam software update. Submitted by Norm Roulet on Wed, 02/23/2011 - 04:20. Jenny07 returned tonight and was killed on contact - about the sixth spammer I've killed tonight. What scumbags.